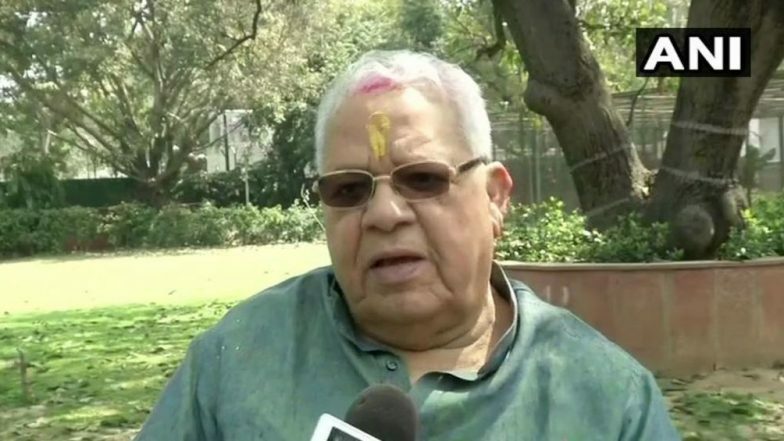 Deoria, March 21: Kalraj Mishra, a senior Bharatiya Janata Party (BJP) leader and Member of Parliament (MP) from Uttar Pradesh's Deoria has announced that he will not contest the upcoming 2019 Lok Sabha elections. The announcement from 77-year-old comes just days before the general elections. Mishra has served as Minister of state of Micro, Small and Medium Enterprises from May 26, 2014, to September 2, 2017, in the BJP led NDA government of Prime Minister Narendra Modi. Choosing to focus on responsibilities given to him by BJP, the former union minister told news agency ANI that, "I will not contest elections this time, I have been given a lot of other responsibilities by the party so my time will be devoted to that." Lok Sabha Elections 2019: BJP Veterans Including LK Advani May Contest Polls. The Veteran politician had earlier said that BJP will have no problem winning in Uttar Pradesh. The entry of Priyanka Gandhi Vadra will have no benefit for Indian National Congress, he said speaking to a media house. In 2014 Lok Sabha elections, Mishra defeated Mayawati-led Bahujan Samaj Party's Niyaj Ahmad. The seasoned politician received 4,96,500 votes, winning by a margin of more than 2.65 lakh votes. Meanwhile, the upcoming elections in Uttar Pradesh will be held in seven phases beginning from April 11 to May 19. The counting of votes will take place on May 23, 2019.